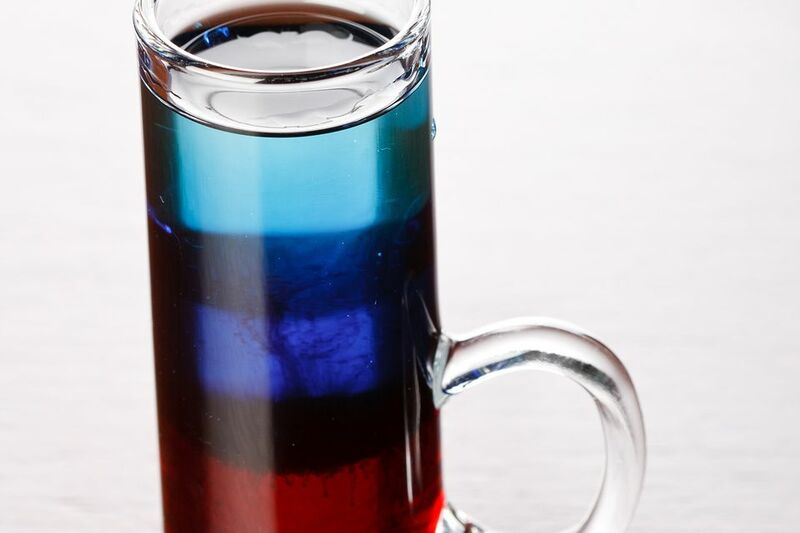 The Fourth of July (or patriot) is a popular layered shot drink that shows off the color of the American flag in a glass. It's a fun vodka shooter for Independence Day parties or anytime your celebration has a patriotic theme. This is actually one of the easiest layered shots you can create, so it's a perfect place to begin practicing your floating skills. It comes together easily because the density of the three ingredients are very far apart from one another and you will have no troubles creating distinct layers. If you don't want to use up your vodka, you can top your shot with peach schnapps instead. In this case, you will be creating a shooter called the red, white, and blue. ​It offers the same look but has a fruitier flavor. Both are fun drinks for any party and the perfect excuse to show off some of those bartending skills you've been working on. Pour the grenadine into a shot glass, filling it one-third full. Float the blue curacao on top of the grenadine by pouring it over the back of a bar spoon. The glass should now be two-thirds full. Float the vodka on top (pouring over a spoon) to fill the glass. There are two simple things to keep in mind when creating layers in any drink: pour the last two ingredients over the back of a spoon and pour them in order. To remember the layering order, simply think about how much sugar is in each ingredient—more sugar equals a heavier liquid. Also, the higher the alcohol content, the lighter the liquid will be. Grenadine is a syrup and one of the thickest, heaviest ingredients in the bar. It almost always goes on the bottom. The sweet orange liqueur known as blue curaçao is perfectly situated in between. Vodka is one of the lightest liquors, has the highest proof, and contains no sugar, so it goes on top. How Strong Is the Fourth of July Shooter? There is no mixing this drink, so there's no water to dilute it. Grenadine is alcohol-free and that helps tame this shooter down a bit as well. In the end, you'll create a shot that is relatively mild at 46 proof (23 percent ABV). The Fourth of July is nowhere near as potent as a shot of tequila, but it's also not the weakest shooter you can bring to the party. The sweet taste can be deceiving, so be careful because this one will sneak up on you. Layered shooters saw their heyday before the turn of the century. During the 80s and 90s, these colorful little drinks rocked the bar, but they've lost a bit of steam since. That doesn't mean they are any less fun to make or drink; it's just one of the many trends that are common in the bar world. If you want to explore more of these retro drinks, be sure to play around with these recipes. The B-52 is the hottest of the lot, arguably the best tasting, and still has many dedicated fans. B-50 Shots: A family of very popular layered shooters, the B-52 stands out and is made of Kahlua, Baileys, and Grand Marnier. Irish Flag: Similar to the Fourth of July, the Irish flag replicates Ireland's colors with green creme de menthe, Irish cream, and Grand Marnier. Irish Frog: Perfect for beginners, you only need to worry about two layers—Midori and Irish cream—for the Irish frog. Jelly Bean: You can use either grenadine or blackberry brandy for the jelly bean. That layer is topped with sambuca and Southern Comfort for a tasty candy-like treat. Santa Shot: Minty is an understatement for this holiday-worthy shot. It layers grenadine, green creme de menthe, and peppermint schnapps.